HAVE YOU EVER PET A FLUFFY BABY ALPACA, RODE AN ENORMOUS CAMEL, OR BEEN CLOSE ENOUGH TO SEE A ZEBRA'S EYELASHES? GIDDY UP RANCH HAS BEEN PROVIDING CLEAN, HEALTHY, LOVINGLY RAISED ANIMALS FOR MORE THAN 30 YEARS. WE OFFER UNIQUE, MEMORABLE, AND EDUCATIONAL SERVICES THAT ENHANCE ANY TYPE OF EVENT. 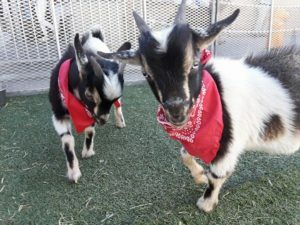 FAIRS, WEDDINGS, SCHOOLS, CARNIVALS AND BIRTHDAY PARTIES, WE DO THEM ALL, BRINGTING THE HAPPIEST, CUTEST, AND FRIENDLIEST CRITTERS AROUND. WE ENJOY SHARING THE JOY OUR ANIMALS BRING AND TAKE PRIDE IN MAINTAINING A FUN, SAFE, AND PROFESSIONAL ATMOSPHERE. WE LOVE OUR ANIMALS, AND WE KNOW YOU AND YOUR GUESTS WILL TOO. WE SERVE ALL OF SOUTHERN CALIFORNIA, BUT WILL ALSO TRAVEL FOR LARGE EVENTS HELD THROUGHOUT THE UNITED STATES. WE ARE USDA LICENSED AND INSURED. WE LOOK FORWARD TO MEETING YOU! 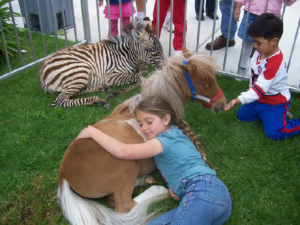 WE OFFER A WIDE VARIETY OF PETTING ZOOS TO ACCOMMODATE YOUR SIZE AND THEME NEEDS. 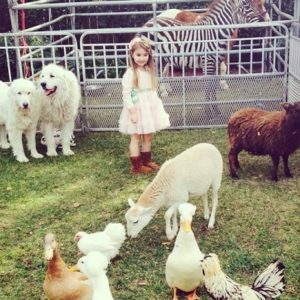 OUR FAIR ZOO CONTAINS A DELIGHTFUL MIXTURE OF APPROXIMATELY 25 FARM AND EXOTIC ANIMALS. IT INCLUDES SHEEP, DUCKS, GOATS, CHICKENS, RABBITS, AND A PIGLET. THE ZOO WILL ALSO CONTAIN TWO OR MORE OF THE FOLLOWING: ALPACA, LLAMA, DONKEY, OR PONY. 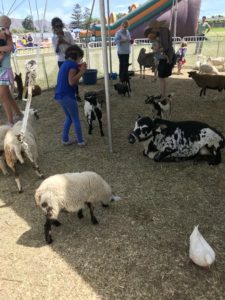 EXOTIC ANIMALS WILL BE ADDED BASED ON AVAILABILITY, AND MAY INCLUDE ONE OR MORE OF THE FOLLOWING: A CAMEL OR ZEBRA, YAK, PARROT, TORTOISE, ROCK DOVE, ZEBU, BABY DOLL SHEEP AND NIGERIAN GOATS. MORE ANIMALS OR SPECIFIC ANIMALS MAY BE INCLUDED UPON REQUEST. 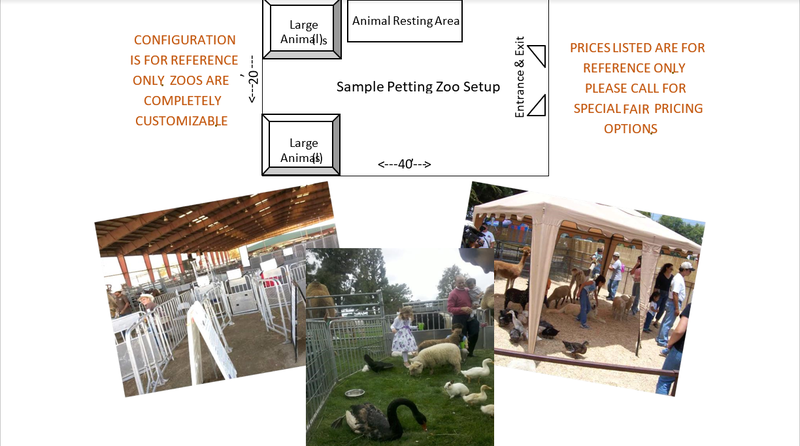 ALL OF OUR ZOOS ARE FULLY CUSTOMIZABLE AND CAN RANGE IN SIZE FROM 10’X10’ TO 100’X100’. ANIMALS ARE CONTAINED BY FENCING AND ARE MONITORED BY AN EXPERIENCED HANDLER. SOME LARGER OR EXOTIC ANIMALS MAY BE SEPARATED AND CONTAINED WITHIN THE ENCLOSURE WITH AN ADDITIONAL SAFETY BARRIER FOR VIEWING ONLY. THE SAFETY BARRIER FOR CAMELS WILL BE 5’ OR MORE. IF FEEDING OR PETTING OF THE LARGER ANIMALS IS REQUESTED, A DESIGNATED HANDLER WILL BE ASSIGNED TO EACH ANIMAL. ANIMALS ALWAYS HAVE ACCESS TO WATER. SHADE IS PROVIDED WITH CANOPIES COVERING ALL OR A LARGE PORTION OF THE ZOO. HAND SANITIZER AND SAFETY SIGNS ARE LOCATED NEAR THE ENTRANCE AND EXIT. OUR FEE CAN BE STRUCTURED IN ONE OF TWO WAYS. THE FIRST OPTION ALLOWS FOR A FLAT FEE TO BE COLLECTED FROM THE ENTITY ORGANIZING THE FAIR. THE ENTITY MAY THEN CHOOSE TO CHARGE PATRONS AN ENTRANCE FEE TO THE ZOO AND KEEP THE PROCEEDS. OUR TYPICAL FLAT FEE FOR A FAIR ZOO IS $2,000.00 FOR AN 8 HOUR DAY. EACH ADDITIONAL HOUR IS $300.00. 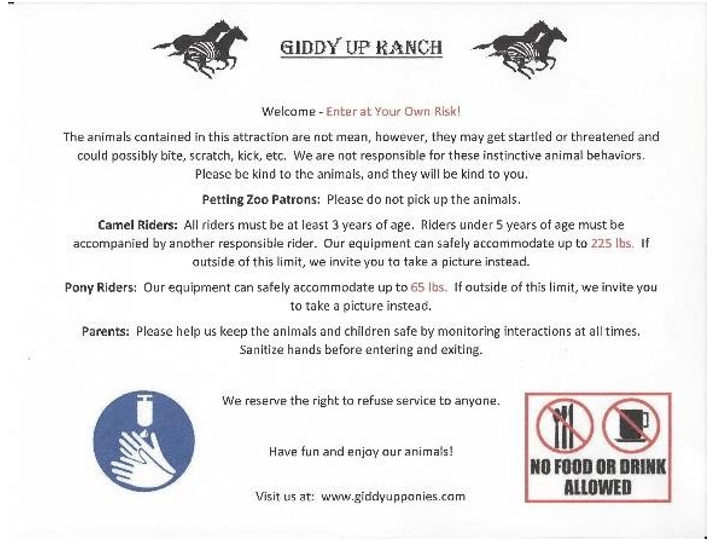 THE SECOND OPTION IS FOR GIDDY UP RANCH TO COLLECT AN ENTRANCE FEE FROM FAIR PATRONS. IN THIS CASE, PATRONS ARE CHARGED $5.00 FOR ZOO ENTRANCE. PARENTS MAY ACCOMPANY THEIR CHILDREN INTO THE ZOO FOR $1.00. CUPS OF FEED CONTAINING HAY, CARROTS, AND/OR GRAIN CAN BE PURCHASED FOR $1.00. WE CAN PROVIDE HAND-LED PONY RIDES ALONG A DESIGNATED PATH, OR CAN PROVIDE UP TO 4 PONY SWEEPS. OUR SWEEPS CAN ACCOMMODATE BETWEEN 4 AND 8 PONIES. WE HAVE A VARIETY OF PONIES RANGING IN COLORS, SIZES, AND BREEDS. THEY ARE ALL CLEAN, FRIENDLY, AND WELL-GROOMED. 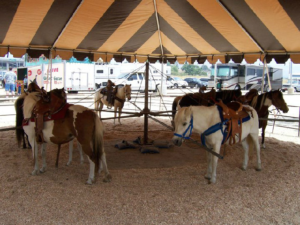 PONY RIDES ARE CUSTOMIZABLE JUST LIKE OUR PETTING ZOOS, BUT EACH SWEEP REQUIRES A MINIMUM AREA OF 30’X30’. ALL PONIES COME EQUIPPED WITH SADDLES, PADS, AND HALTERS AND WILL BE GUIDED BY TRAINED STAFF MEMBERS. PONIES ARE ROTATED TO ALLOW FOR REST. SHADE, FOOD, AND WATER ARE PROVIDED WHILE PONIES ARE RESTING. HAND SANITIZER AND SAFETY SIGNS ARE LOCATED NEAR THE ENTRANCE AND EXIT. OUR FEE CAN BE STRUCTURED IN ONE OF TWO WAYS. THE FIRST OPTION ALLOWS FOR A FLAT FEE TO BE COLLECTED FROM THE ENTITY ORGANIZING THE FAIR. THE ENTITY MAY THEN CHOOSE TO CHARGE PATRONS FOR EACH PONY RIDE AND KEEP THE PROCEEDS. OUR FLAT FEE FOR A 6 PONY CAROUSEL FOR 4 HOURS IS $1050.00. EACH ADDITIONAL HOUR IS $200.00. OUR FLAT FEE FOR AN 8 PONY CAROUSEL FOR 4 HOURS IS $1,200.00. EACH ADDITIONAL HOUR IS $200.00. THE SECOND OPTION IS FOR GIDDY UP RANCH TO COLLECT A FEE FROM FAIR PATRONS. IN THIS CASE, PATRONS ARE CHARGED $7.00 PER PONY RIDE. 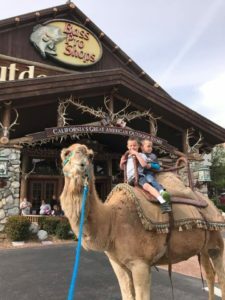 WE CAN PROVIDE ONE, OR UP TO 5 CAMELS FOR AN EXPERIENCE YOU WILL NEVER FORGET! FOR RIDES, A HANDLER WILL LOAD AND UNLOAD YOU AND YOUR GUESTS FROM THE BACK OF THESE AMAZING CREATURES. RELAX AND ENJOY A SMOOTH SWAYING RIDE ALONG A TRAIL. OUR CAMEL SADDLES SEAT ONE OR TWO ADULT PASSENGERS, OR UP TO FOUR CHILDREN (NOT TO EXCEED 225 LBS.) RIDERS MUST BE AT LEAST 36” TALL OR 2 YEARS OF AGE. THE STAIRWAY MAKES IT EASY TO GET ON AND OFF THESE GENTLE GIANTS, BUT WE HAVE SEVERAL LOADING OPTIONS. WE CAN WORK WITH THE AMOUNT OF SPACE YOU HAVE AVAILABLE. IF YOU HAVE A LIMITED AMOUNT OF SPACE, JUST ASK IF WE CAN CONDENSE OUR SETUP. 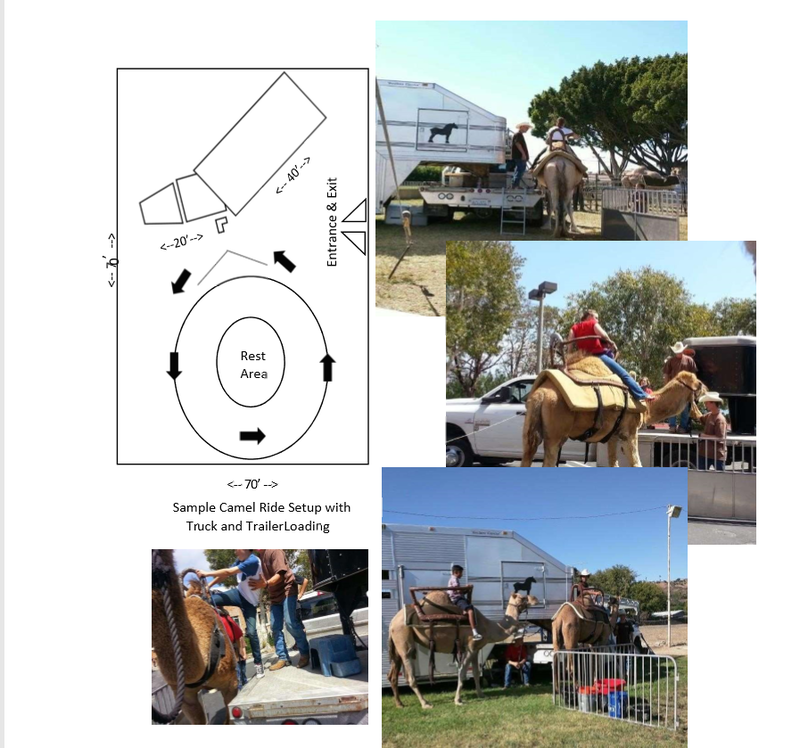 CAMELS ARE ROTATED AND RECEIVE BREAKS EVERY 4 HOURS. FOOD, WATER, & SHADE ARE PROVIDED IN RESTING AREA. HAND SANITIZER AND SAFETY SIGNS ARE LOCATED NEAR THE ENTRANCE AND EXIT. OUR FEE CAN BE STRUCTURED IN ONE OF TWO WAYS. THE FIRST OPTION ALLOWS FOR A FLAT FEE TO BE COLLECTED FROM THE ENTITY ORGANIZING THE FAIR. 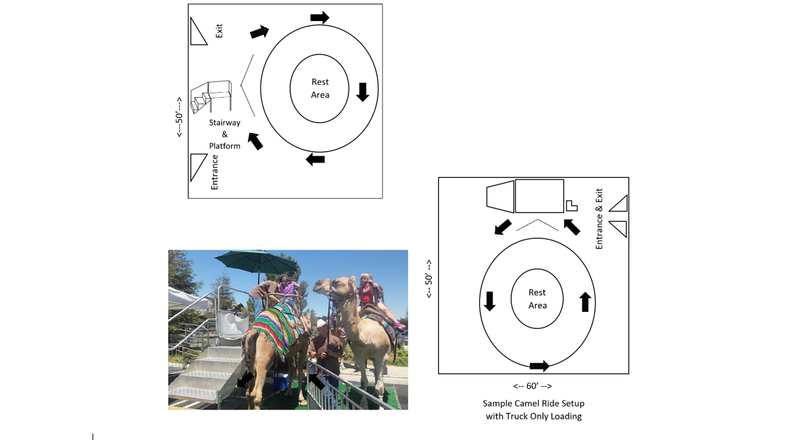 THE ENTITY MAY THEN CHOOSE TO CHARGE PATRONS FOR EACH CAMEL RIDE AND KEEP THE PROCEEDS. OUR TYPICAL FLAT FEE FOR 2 HOURS OF CAMEL RIDES WITH ONE CAMEL IS $1,100.00. 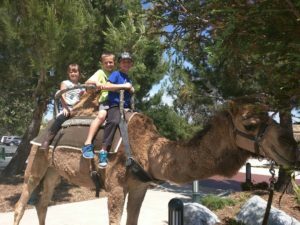 2 HOURS WITH TWO CAMELS IS $2,000.00. 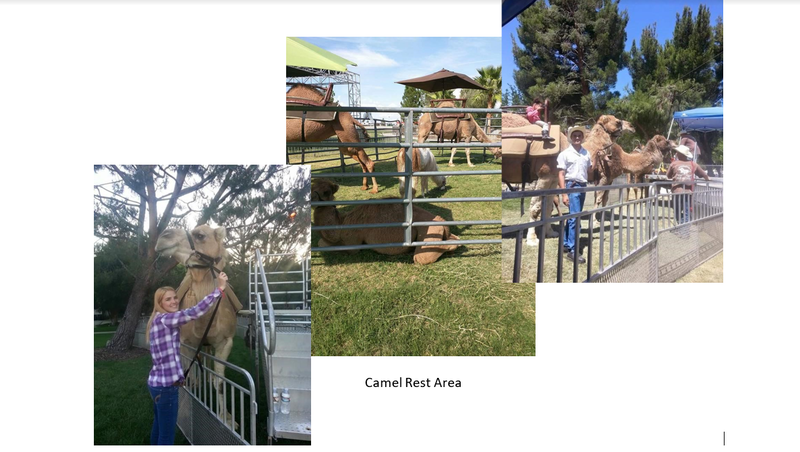 2 HOURS WITH 3 CAMELS IS $2,800.00. EACH ADDITIONAL HOUR IS $200.00 PER CAMEL. THE STAIRWAY MAY BE ADDED FOR $100.00. WE WILL PROVIDE BACKGROUND CHECKS/LIVESCAN FOR EACH OF OUR STAFF MEMBERS UPON REQUEST. WE KINDLY REQUEST ACCESS TO A DUMPSTER, POWER, & WATER IF FEASIBLE. OUR ANIMAL ENCLOSURES ARE CLEANED AS NEEDED TO MAINTAIN THE HEALTHIEST ENVIRONMENT POSSIBLE. PLEASE KEEP IN MIND, WE CAN CUSTOMIZE THE SIZE AND ORIENTATION OF ALL OF OUR SETUPS TO MEET YOUR NEEDS. INSURANCE AND USDA CERTIFICATE ARE RENEWED ANNUALLY. ADDITIONAL INSURED CERTIFICATES CAN BE OBTAINED BY REQUEST FOR AN ADDITIONAL FEE OF $50.00. CITY BUSINESS LICENSES ARE OBTAINED AS NEEDED.